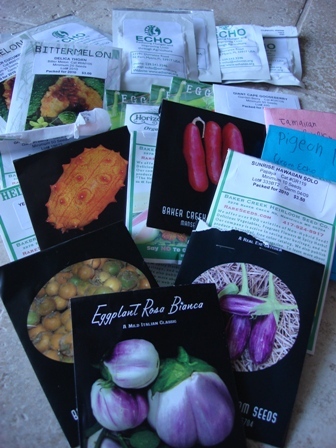 We order our seeds from seed catalogs. The above picture shows what we receive in the mail every year. 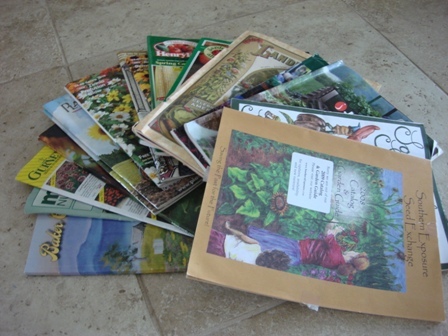 Most seed companies have a yearly catalog they will send you. We love these catalogs. My son and I sit for hours and take notes of the new and exciting seeds that we want to order. We spread them all over the rug and say, “oooh…look at this one!” Most catalogs will give lengthy descriptions about each seed they offer and it is quite educational. Some of these catalogs have gorgeous pictures and read more like a book than a catalog. Our favorite seed companies are Landreths, Baker Creek, Johnny’s, and Horizon Herbs. 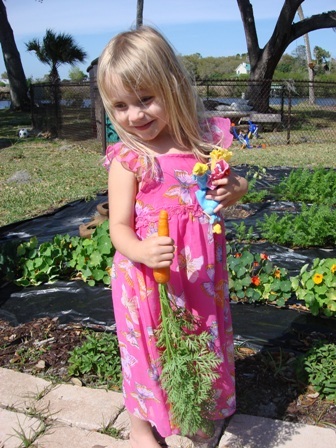 We used to buy our little vegetable plants at the big hardware stores such as Home Depot and Lowe’s. It was easy, but expensive. I learned quickly that it is much better to grow your plants from seed. It definitely makes the extra effort worth it. Also, there is a ton of controversy over genetically modified food (GMO’s) and growing from seed allows you to control what you grow…and eat. If you save the seeds from the foods you grow then you have even more control. Saving your own seeds is easy and fun and everybody should do it. I highly recommend the documentary Food Inc. . Our future depends on these issues and how they’re handled. For someone who is new to gardening and just trying to get something started, I do recommend buying the small plants from Home Depot or Lowe’s. If you keep them in full sun and water them, you will be bitten by the gardening bug. It won’t be long before you are ordering and saving your own seeds too. A great way to store your seeds is in an air tight container. Ideally, they should be in an environment that has 50% humidity and at 50 degrees. That can be tough to accomplish. It’s important that they be kept dry and in a place where the temperature doesn’t fluctuate too much. The cooler it is, the better. Most seeds are viable for up to 3 years and some up to 10 years if stored correctly. One of my favorite authors, Steve Solomon, has a great idea for keeping his seeds stored. He bought a pound of silica gel desiccant crystals (inexpensive) from a craft store and keeps them in a cloth sachet in the seed storage container. The crystals are dark blue when they are dry and pink when they have soaked up all the moisture they can hold. They can be reactivated by heating them in an oven at 212 degrees on a cookie sheet. Don’t heat them any hotter than this. They must be put into an airtight container after they have cooled for a little while. This is an important step so they don’t soak up moisture while they’re cooling off completely. You can do this reactivation as many times as necessary. I bet these silica sachets would be great in the back of a humid closet as well. When I cook eggs I use a knife and lightly tap the top off the egg. 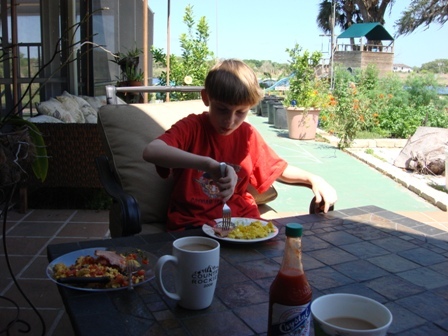 After I cook the egg, I always rinse the inside out and I poke a hole in the bottom of the shell. I let them dry in a bowl with a paper towel underneath to soak up the extra moisture. 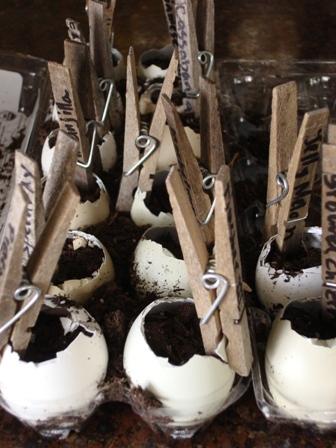 When we plant the seeds in the eggshells we put the empty shells back into an egg carton. When it’s time to put the seedling in the ground, we gently break off the bottom of the shell. It helps to lightly crush the edges of the shell too. It stays intact long enough to get it into the ground without disturbing our seedling and provides calcium to the young plant. This week we planted some pumpkin seeds from Jamaica, pigeon peas from Echo, Hawaiian sunrise papaya, melocoton cassabanana, garden berry naranjillo, Pandora striped rose eggplant, jelly melon kiwano, strawberry husk ground cherry, extra long dancer snake melon, two types of bitter melon, several unique eggplant varieties, Malabar spinach, jicama (yam bean), New Zealand spinach, winged bean and two types of tomatillos. 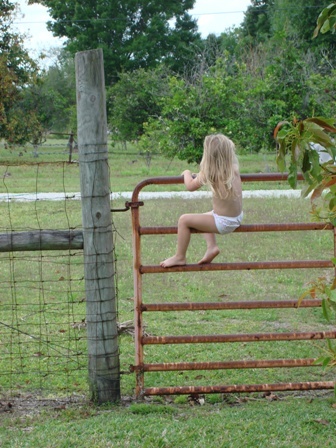 Summer in Southwest Florida can be extremely hot and humid. Most vegetables and herbs the rest of the country are growing in the summer won’t grow in south Florida during this time. So, during the summer we grow lots of tropicals.